Regrettably, it’s no longer merely black people who believe they have nothing for which (or nobody for whom) to vote. It’s vast swaths of the electorate, of all races, creeds, sexes, ages, etc., which is why the participation rate in the 2016 American presidential election hit a 2-decade low, with 45% of eligible voters staying away from the polls. The article concludes “Just 14% of eligible adults — 9% of the whole nation — voted for either Mr. Trump or Mrs. Clinton” in the primary elections that culled the field to the 2 major-party winners who were (let’s be frank here) the only viable choices for the presidency. Deb is a pro-business feminist. She thinks it’s high time that the US elected a woman as president after 227 years when only men (43 of them) held the job. But, while she favors Hillary Clinton’s accommodation of the corporate world, the right-wing smear machine has made her uneasy about Clinton’s character. Deb would really like to vote for Carly Fiorina, but the Republican primary voters denied her that opportunity. Deb ends up voting for Jill Stein, knowing that her vote won’t have any real effect because Stein doesn’t have a realistic chance, but thinking that at least she’s given a nod to the idea of a female president. Rob is a working man, a Catholic blue-collar farmhand. He’s been screwed by the system for years and wants someone in the White House who’s sympathetic to regular guys like him. Donald Trump says all the right things, but he’s a billionaire with no personal understanding of getting his hands dirty, and he’s said rotten things about Hispanics. Rob himself works side by side with Mexican Americans every day, and his son is married to a Guatemalan girl. They’re all fearful about Trump, and Rob concedes that they’ve got a point. Besides, the left-wing smear machine has made him uneasy about all the contractors who did work for Trump’s properties and whom he subsequently stiffed when the bill came due; Rob knows who ends up with the short end of that stick! The guy who really speaks to Rob’s concerns, especially the part about affordable higher education for his grandchildren, is Bernie Sanders, but the Democratic primary voters denied him the opportunity to vote for Sanders. Rob ends up just skipping the election altogether. May is an engineer, a solidly results-oriented pragmatist. She has to work all the time with a variety of people like architects, interior designers, building contractors, website developers, and of course customers. It’s an intensely collegial process with a lot of give and take. She loathes the hard-line ideological posturing and gridlock of the nation’s capital. She might be inclined to vote for a “hands across the aisle” liberal Republican like Nelson Rockefeller or a conservative Democrat like Jimmy Carter, but those kind of political animals have gone from being “a vanishing breed” to outright extinct. What she’d really like to see is a sensible centrist with experience running a large organization, such as an Internet entrepreneur, big-city mayor, or university president, but under the current system none of those would even think of running, because they couldn’t get the backing of either the leftist-dominated Democrats or the rightist-dominated Republicans. The last presidential candidate she voted for was Independent H. Ross Perot back in 1992. After that, in disgust, she confined her voting to state and local elections. But the Supreme Court’s atrocious Citizens United decision in 2010 opened the floodgates to huge spending by outside interests, and that sordid fact was driven home to May when voucher-school advocates spent hundreds of thousands of dollars trying to buy seats on her local school board in 2012. After that she just said “to hell with it all”. May not only doesn’t vote, she’s stopped paying attention to politics at all and advised all her family, friends, and colleagues to do the same. For a mixture of reasons, Deb the disappointed, Rob the discontented, and May the disillusioned — and millions of people like them — couldn’t vote for a candidate they really wanted. We could fix this with instant-runoff voting (IRV), as advocated by the FairVote organization (which also calls it rank-order balloting or preferential voting). Why would we want to do this? Well, consider how the current plurality-winner setup works. 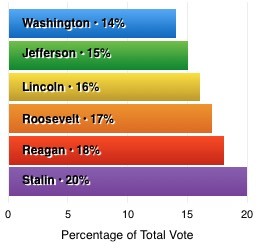 Do a little mental exercise and imagine an election which came in at 14% for George Washington, 15% for Thomas Jefferson, 16% for Abraham Lincoln, 17% for Franklin Roosevelt, 18% for Ronald Reagan, and 20% for Josef Stalin. Clearly 80% of the electorate favored a candidate dedicated to American principles of freedom and democracy, but their vote got split 5 ways, and the Communist dictator ended up winning. This hardly reflects the dominant will of the electorate. A voter would just blacken the preferred circle for each candidate, and the optical ballot reader would take it from there. As is the case right now with primary elections, where you can’t vote in more than one party, the machine would spit the ballot back if you had marked, say, both Lincoln and Roosevelt as your #2 choice, and you’d get a chance to fix it. 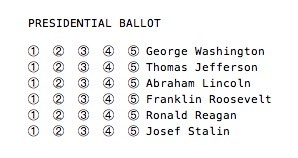 Under this method, Voter X could rank the candidates in order of preference — for example, Washington 1st, Lincoln 2nd, Roosevelt 3rd, Jefferson 4th, Reagan 5th, and Stalin not at all (as unworthy of office). X's ballot would initially be counted for Washington, but since none of the candidates got a majority on the 1st round of tallying, and because Washington had the lowest vote total, all Washington ballots would be reallocated to their 2nd choice (in X's case, to Lincoln) on the 2nd round. This would continue until somebody got a majority (almost certainly not Stalin, despite his early lead). A candidate could list the party he or she most closely identifies with, of course, and state and national parties could still endorse their preferred candidates. In fact, they’d be even freer to do so. The national Republican Party could still endorse Donald Trump, but the Wisconsin GOP might throw its weight and support behind Ted Cruz. The national Dems might still back Hillary Clinton, but their Wisconsin counterparts could go with Bernie Sanders. And so on. The key thing to remember is that lack of a party endorsement wouldn’t deny anyone a place on the ballot. (1) Electing the president directly, without skewing by the Electoral College. (2) Eliminating ideologically driven primary elections. (3) Giving citizens a wide variety of candidates to choose from. 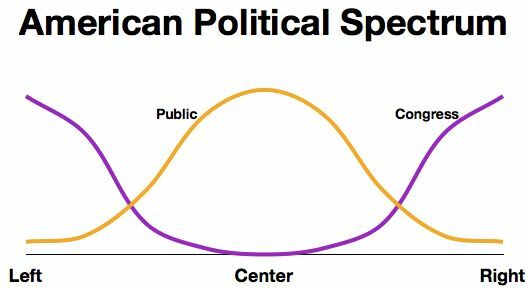 (4) Eliminating the “spoiler effect” of voting for a 3rd-party candidate. (5) Substantially increasing citizen participation in elections. (6) Halving the cost of conducting elections. First, a disclaimer. Eliminating the Electoral College could happen with or without IRV. But, as I hope to show below, it would be better with it. My former state representative, Spencer Black, wrote a compelling essay in the local newspaper about his opposition to the Electoral College, and I refer you to it for his analysis of the problem. For a quick example of it, however, let’s look at the presidential vote in Wisconsin, where there were 7 candidates on the ballot, nobody achieved a majority, and the state’s 10 electoral votes went to the candidate who got 47.9% of the human votes. Turning that into 100% of the electoral votes is, as Spencer notes, Not A Good Thing. However, I differ with Spencer’s proposed “cure”: plurality victory. He writes approvingly: “For every office from county coroner to U.S. senator, the person who gets the most votes wins.” But 47.9% isn’t precisely "the most", only “more than anyone else”, that is, a plurality. As I noted above, plurality victory occasionally leads to the Stalin scenario and therefore should be avoided. Better to insist on a majority. 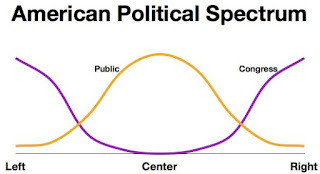 This means that the more “pure” a candidate is with respect to rigid pandering to her or his party’s main constituency, the less flexible he or she is when it comes time to govern, with all of its messy compromising and actually trying to, you know, get things done. No elected official wants to be called a RINO or a DINO and “get primaried” by an even more extreme member of their own party. Remember the dozen names above of highly competent people who weren’t even on the ballot? They could have been if it weren’t for primary elections allowing the 2 major political parties serve as gatekeepers. But under IRV, a whole new world of possibilities would open up for the average citizen. Democrats could vote for Republicans; Republicans could vote for Democrats; everybody could vote for moderates. Choice is good. The classic example of the “spoiler effect” of 3rd-party candidates happened in Florida in 2000. Liberals who really liked Ralph Nader but would have settled for Al Gore were faced with the quandary of whether to vote their consciences, knowing that not voting for Gore might lead to a victory for Republican George W. Bush, whom they didn’t like at all (thereby making them complicit in Nader’s “spoiler” role), or whether to abandon their principles and vote for Gore, thereby understating the extent of support for Nader’s clean-government agenda. Meanwhile, conservatives who really liked Pat Buchanan and kinda liked Bush were faced with a comparable dilemma. In the end, it came down to 537 votes out of nearly 6 million cast, and there’s no doubt that some kind of “spoiler effect” was in play, casting lingering doubt on whether the election truly represented the will of the people. But under IRV, voters who preferred a 3rd-party candidate (either Nader or Buchanan) wouldn’t be wasting their votes, knowing that they’d still have a shot at their 2nd choice if their favorite failed to make the cut. And, once the statistics were published on how that 1st round of voting went, we’d get a much better idea of how many Americans really weren’t happy with the so-called “mainstream” alternatives, since they wouldn’t have chickened out at the last minute in the voting booth. Finally, it might be that a 3rd-party candidate would actually pull an upset because he or she proved to be almost everybody’s favorite 2nd or 3rd preference. 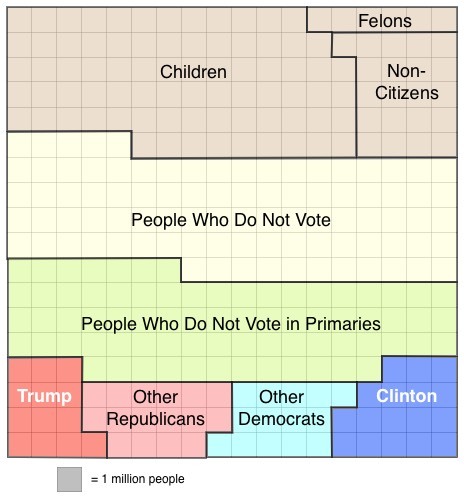 It doesn’t take a lot of imagination to see that citizens would have substantially increased interest in voting once their ballots actually listed people they wanted to vote for. People like May Miller would stop bad-mouthing the process and might even end up driving her friends and nabors to the polls. Broader citizen participation could only be good for a democracy. If states don’t have to conduct primary elections, they don’t have to pay for them. This is of special significance due to the typically low voter turnout for the primaries. They still require full staffing of polling places, which means that the cost per vote cast is dramatically higher than for general elections. Granted, financial considerations are deservedly last in this list of virtues, but they’re not insignificant. For example, the 2012 general election in Wisconsin cost $10,000,000 to administer, and Wisconsin’s about an average state, so it’s reasonable to project that figure up to 50 times as much, or half a billion dollars, for the nation as a whole. We could save that much for every primary election we eliminate. I’m hard pressed to think of anyone who thinks it’s worth spending twice as much to get poorer results. The main reason for transitioning to IRV is that it more fairly represents the will of the electorate. But, in addition, as I hope have shown above, it would offer many other advantages as well, not least of which is restoring some semblance of civility to the democratic process by reinvigorating the respectability of sensible, moderate compromising instead of extreme ideological “purity”.